Horrible crash involving Simoncelli and Edwards in lap 2. Edwards is okay, with a shoulder injury, but Simoncelli is a question mark. Race was red flagged, then canceled. Last edited by VTRsurfer; 10-23-2011 at 02:23 AM. A sad loss indeed. Simoncelli seemed to be finding his legs this year on the competitive side of the very best racers in the world. I enjoyed watching his efforts start to pay off and as always his massive personality on and off the track. He will be missed by all. well that bites! Last year i witnessed the death of peter lentz at the Indianapolis Moto GP and it is undoubtedly something that remains with you. Thankfully, in these modern times racing has become relatively safer, the exception being the IOM. marco was doing what he loved with a passion that was obvious to anyone who watched him race. If we're honest about it, anyone of us can suffer the same demise anytime we throw a leg over. That's the risk we're willing to take to do something we love no matter how we rationalize that possibility away. The options are stay safe and die of cancer, heart attack, car wreck or overeating. **** that. race enthusiasts who have seen this wild man on the track will miss seeing his passionate and courageous passes, but be thankful that he was able to experience doing what he loved a decade longer than peter lenz. we're with ya marco and peter! MotoGp lost their best and most interesting people. big loss. big loss of talent - even as huge as he was physically compared to most other top riders he was able to be competitive - just a matter of time and maturity to championship. Equally terrible has to be for Rossi - having been one of the unavoidables to crash right into his best friend. what a tragic feeling, though nothing he could have done anythign about. Last edited by cliby; 10-23-2011 at 09:39 AM. My wife and I were watching the race at 1am. Simoncelli lost the front end but hung onto his bike trying to save it. Then as Ben Spies said in the announcers both, his front tire got traction, and he rocketed across the track with the bike laid down, right into the path of Edwards and Rossi. Edwards hit him straight on, unavoidable, with his bike landing on top of Marco. Rossi avoided going down and rode it out. As Rossi continued down the track, the camera followed him, and he looked back, then crossed himself. At that point we knew it was very bad. Then the helicopter did a very quick wide shot straight down at the track, showing Marco's limp form in the middle of the track. It was horrible to watch. Edwards was just sitting on the grass infield, where he landed, staring out at the track. After the red flag, everyone went back to the pits and waited. Then after about 20 minutes or so (it was a live feed) they announced that the race had been canceled, and Speed went to another program. Marco's fate was still unannounced at that time. I too was a fan of Simoncelli, for his crazy character and his huge riding skills. Marco was one of my favorite riders, and at just 2 years older than i am, he was someone I looked up to and aspired to be like. I hope this does not slow Rossi and Edwards down. It was a horrible thing to happen for everyone involved and I hope they will be able to get through it. first thing i though of when i heard the news was seeing him riding on a golf cart past us through the infield at indy. every went nuts. RIP Marco.....Not a whole lot of words that can be said. He was always fun to watch. Tweety you are right. This one will be hard for Colin to get over and past. R.i.p. kid,ride hard up there. Having seen it twice, live and a few minutes later on replay, there was absolutely nothing Edwards could have done. Spies said they're going about 140kph (90mph) at that point on the track, and Marco came from the far outside of the turn. Colin's eyes would have been looking through the turn, and he wouldn't have seen Marco until an instant before impact. I might add that I have no desire to see it again. Very sad for racers and riders everywhere. I too was watching with my wife and I am sure it kinda woke her up to what I risk in the 11yrs of racing since we met. Like nath says, it is absolutely part of the game for all of us. Lost a brother that way but none of us gets outa here alive. He was doing with passion what he loved. God bless his family. Terribly sad. It looks to me like Rossi's bike hit Simoncelli square in the head. 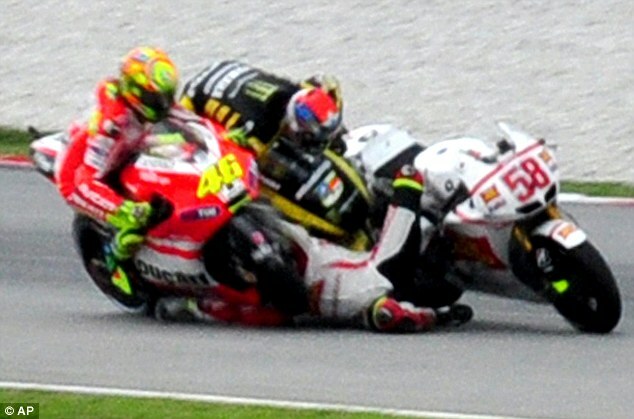 Both Edwards and Rossi tried to avoid contact, but they had no time and no room to do so. Wow...really sad to hear. prayers to his family and friends. Rossi as well. It's hard to tell from the rear shot vids, but from the side still shots it looks like Colin hit Marco's bike and left leg. As killer5280 points out, it's Valle's bike which hit his head and torso. That explains Rossi crossing himself as he rode on. He knew. I can't imagine how someone would deal with that. It's just so tragic, for the Simoncelli's and Rossi and Edwards. Last edited by 8541Hawk; 10-24-2011 at 07:53 AM. Marco left this world, on his own terms. Enjoying/competing for a fourth place run, on his chosen adrenaline joy. I will miss watching his skill, and competitive,humorous character.. Such a tragedy. My first thought, before seeing the footage was that he was probably overly aggressive and caused the accident. But this was not the case. He was finally gaining some maturity. He was an exceptionally talented and fearless rider. It was a racing incident. He must have been able to get a load on the front tire, trying to save it, but the back kept coming around. Soichiro should have said "You can fail 100 times, as long as you don't have Edwards and Rossi behind you." What, too soon? RIP. I know I'll miss his mug and personality. Thats the first time I saw it from that angle. The irony is unbelievable. Can you imagine what Rossi is gonna feel when he sees that pic? You couldn't write a tragedy like that if you tried. It's so true what they say that truth is stranger than fiction. Tomorrow in Valencia, a tribute will be paid to Marco Simoncelli. Riders from all 3 catagories, MotoGP, Moto2, and 125, are invited to participate. The riders will exit Pit Lane as a group, lead by Kevin Schwantz, who will be riding Marco's San Carlo Honda Gresini RC212V. They will do one lap, stopping just short of the finish line. Members of Marco's family, the Gresini crew and officials from MotoGP will gather on the other side of the finish line.